Some books are fairly easy to write. Some are rather more difficult. And some are just like Rubik’s cubes, a jumble of colours twisting and turning with no apparent solution in sight. Blueeyedboy was not so much a Rubik’s cube as that fiendish Chinese puzzle-box in Clive Barker’s Hellraiser movies, the box that summons demons. At least, that’s what it felt like to me – and if a few of those demons managed to crawl inside the pages of this book, then I can’t say I’m entirely surprised. I started out three years ago, with nothing but fragments of plotline and my narrator’s voice to guide me. I’d been going through some troublesome times, and my sunny disposition had taken something of a blow. I found I didn’t want to write, and spent far too much time online, hanging around various sites and searching out ever more ingenious ways of evading reality. Under a pseudonym, I made a number of online friends, wrote a great deal of fanfic, and began to take an increasing interest in the way people interact online, the communities they create and join, and the way they choose to portray themselves. I began to understand that the small communities that have always informed my writing also exist in the virtual world, with the same little cliques of insiders, outsiders, gossips, liars, exhibitionists and bullies as in the “real” world. I understood too, how emotionally dependent people can sometimes become on their virtual friends and their virtual communities, even though there can be no way of knowing how honest these avenues of communication really are. From all this came Blueeyedboy, a dark psychological thriller set in the world of the internet, where no-one is quite what they seem to be, and every taste is catered for, even the ones to which we dare not confess. My, this is dark, isn’t it? And may I say – creepy? Creepy is fine. I like creepy. And yes, this is a very dark tale, although I see it principally as a black comedy, not to be taken entirely seriously. Oh? So it’s not a whodunnit, then? Not exactly. Most of the time I was writing it, I wasn’t sure what (if anything) had been dun, or indeed, by whom. 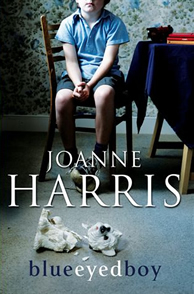 I see it now – like Gentlemen and Players, its close relative – as a kind of murder-mystery with no detective, no apparent crime and a couple of quite unreliable narrators – Joanne Harris with a twist. A twist? And how! Did you plan it all out beforehand? The narrative structure is quite unusual. What made you want to write a novel this way? Most of my books have multiple first-person narrators, but this is a modern take on the epistolary novel, in that all the chapters take the form of entries on a blogging site called WebJournal. Each entry specifies a mood and a soundtrack, and public entries have a Comments box at the end. Some of these entries are public, therefore open to all; others are restricted, or private. I wanted to give both my narrators the freedom to choose both what to say, when to say it and to whom; and I wanted to explore the different ways in which we present ourselves to different audiences and under different circumstances. Concealing information online is not only acceptable, but often expected; the internet is a medium in which inconvenient truths can be dispensed with; from disabilities to marital status, and where one is able to share only the things about oneself that one has actively chosen to share. I’m a Luddite with computers. How much of this techie stuff do I need to know? Tell us about your protagonist. Is he evil, or isn’t he? What about your second narrator, Albertine? Albertine, like B.B., is an ambiguous and somewhat damaged character. Marked by her troubled past, she hides behind an intricate façade, only revealing her true feelings in her private blog. Her love-hate relationship with B.B. is based on shared experience and a kind of dreadful fascination; she knows him better than anyone else, and the link that binds them together has made it impossible for her to find a meaningful, honest relationship with anyone else. Like B.B., she dreams of escaping her life, but instead finds herself drawn into an ever more tortuous game of deceit and emotional manipulation. Identity – both real and fake – tends to be a recurrent theme of yours. How does this book explore the idea? Many of the characters in my books have problems with their identity. In some cases, like that of Vianne and Anouk Rocher, we have someone desperately seeking to create an identity for themselves in a world that seems to deny them the chance. In others, we see someone taking on the identity of someone else – Snyde in Gentlemen and Players; LeMerle in Holy Fools; Zozie in The Lollipop Shoes. Blueeyedboy goes further, in that B.B. has chosen to create, not only an alternate identity, but a whole alternate existence, past and present, designed, not just to fool other people, but to fool himself, too. In fact, in this book, no-one is quite as they appear; identities are interchangeable, and can be assumed and discarded when necessary. It’s a reflection of the way things are going, I think; a comment on the nature of perception and reality. In this story, as in life, the toughest question to answer truthfully is always going to be: Who am I? Synaesthesia plays an important role here. Is this something that you yourself have experienced? I’ve always associated certain colours with tastes and smells. I’m not sure whether this makes me a synaesthete or not, but it made it easy for me to identify with the characters in the book who are. Plus I wanted to explore the idea that what one person feels when faced with a series of stimuli may sometimes differ completely from what someone else may experience in identical circumstances. There’s a lot of music in this book. Does it reflect your personal taste? Absolutely. B.B. and I have a fair bit in common, including a lot of our musical influences. Because one of my characters in blind, I wanted to introduce a less visual dimension than I usually do, and focus on other aspects of perception, such as smells, tastes and sounds. I found this much harder than I’d expected! To compensate for the absence of visual reference in some parts of the novel I found myself dwelling much more on the book’s soundtrack – including the voices of my main characters, and of the “little army of mice” that make up Blueeyedboy’s friends-list. I listened to a lot of music while I was writing the book – like B.B., I rarely took out my i-Pod plugs! As a result, the musical tracks are all carefully-chosen to reflect the mood of each entry as well as containing clues – some more obvious than others – which, put together, make up a series of six playlists (one for each section of the book) which serve as a mini-summary of the plot. Whoa! This is the end? I wanna know what happened next! Never has one of my books received such a “Marmite” reaction. Love it or hate it? What kind of reader are you? Beware unreliable narrators (there are two here) along with a huge plot twist at the end. Harris’s prose is certainly powerful enough for the job. But don’t expect an easy – or comfortable – ride. …it terrified the living daylights out of me. If you are of a sensitive disposition, easily offended or shocked perhaps Blue Eyed Boy is not for you. For everyone else, this is one of the most thrilling, challenging and ultimately exciting novels ever written. Read it! Harris can draw the essence of a character with a few devastating lines, and B.B.’s weird mother — a spiky, mercurial piece of work with a collection of china dogs as huge and lovingly tended to as her grief over her two dead sons — is menacingly memorable. I loved the whole unsettling process! It’s very refreshing to not have everything set out in black and white and handed to you on a plate but to come to your own conclusions whilst being thrown the occasional red herring, or is that just your mind playing tricks on you… Definitely an A* from me. …some of the best stories haunt you for ages, resurfacing at odd moments and make you question your life as you know it, this is one such book and for me emulates the feelings I had as a child after reading the real Grimm’s fairy stories – fear, excitement, wariness and yet greed for more of the same. I have read some intense books this year, and have loved many, but Blueeyedboy jumps to the top of the pile. Now this book is inside my head, I don’t think it will ever leave. Interview in the daily national newspaper, DM. Interview in Noticias Magazine. Our link is to a PDF version – which is a large file! Join for monthly updates, plus special previews of artwork, tips for writers and the opportunity to win signed books and merchandise. Click on the yellow 'Subscribe' tab on the top right of your screen and give your details or go to my contact page. Website design Bionic Graphics. Website created by Envoy.